5 1/2" x 19" engine, 4 hp. 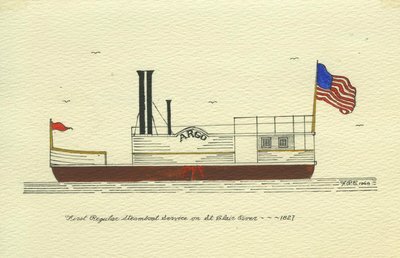 1830-34 First steam ferry Detroit River; run occasionally on Rouge River, Dearborn, MI. 1830 Registered Detroit; ran St. Clair River, to Flats; week to make the round trip from Detroit to Port Huron; first vessel to load Newport(Marine City).